There is no other building in the world remotely like Eltham Palace. It was built in an architectural style which was completely original in concept: it is a game of symbols, clues and secret messages. The game was devised in the 1930s by the architects, John Seely and Paul Paget, for the owners, Stephen and Virginia Courtauld, to play. In this game, every single feature of architecture and design inside the house, on the exterior walls, and also on the rooftop, is a clue which has a meaning which has to be deciphered. When the clues have been decoded, we realise that they are giving out messages about Stephen and Virginia Courtauld; delightful, amusing messages; a paean of praise, with many touches of humour. There are also some messages which refer to the previous owners of the site where the old palace stood centuries before: kings, queens, bishops, knights and so on. It is just possible that the architects may not have explained to Stephen and Virginia Courtauld exactly what they were doing. Possibly they hoped that one day it would suddenly dawn on them that a particular “decoration” was in fact transmitting a message, and the message was saying something beautiful or funny about them. How delightful and thrilling it would be for them, as they decoded and deciphered messages in every room, one by one, taking months or years to understand what their own house was whispering about them. However, if the Courtaulds did indeed discover the existence of the clues, and work out their meanings, they kept their discoveries secret. Eventually they moved out of the house and left England. The game, the messages, the puzzles, were unrecognised for the next fifty years. 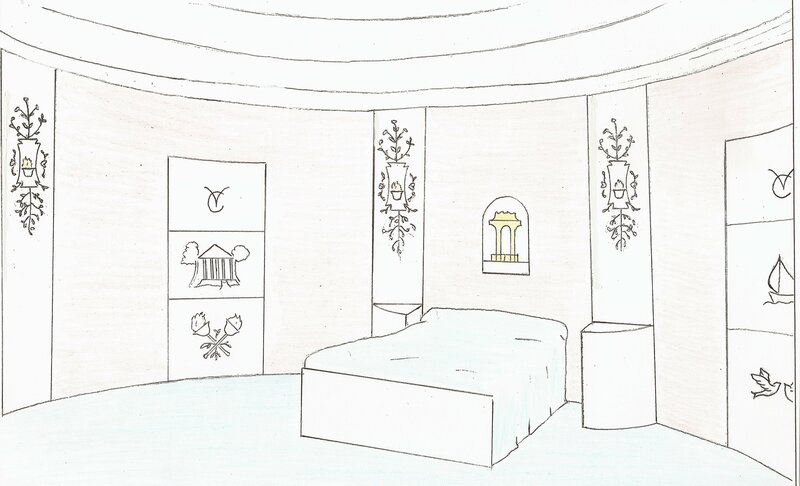 To understand this game, let us look at Virginia Courtauld’s bedroom. (Figure 1 above.) 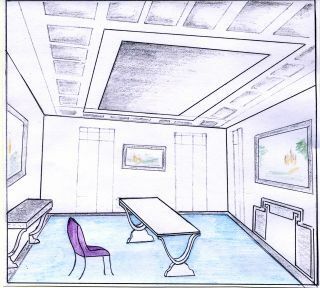 It is an odd room, with half of it semi-circular and the other half rectangular. A circle is carved into the ceiling, with smaller concentric circles inside it. There are raised panels in a circle around the room, with rather strange light fittings on them. There is a niche in the wall, and inside the niche there is a model shaped like a circular Roman temple. There are several trees outside the windows. The light fittings on the pillars are a distinctive shape (see Photograph 4 above) and are entwined with flowers and leaves. Glass and crystal objects were placed on the little shelves above them, so that the light streamed upwards through them and they appeared to twinkle (see Figure 1). These are meant to be flaming torches tied to the pillars of the temple. 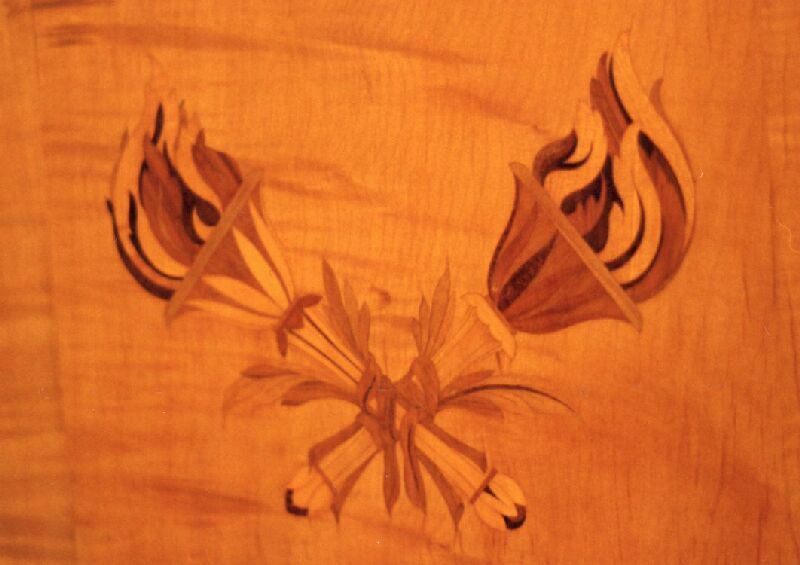 When we look at the third panel of the door (see Photograph 5 above), we see the same distinctive shape of the light fittings in the pair of flaming torches, which are also entwined with leaves and flowers. Flames are of course the symbol of Vesta.. We can now see that the complete message on the door reads, Virginia Courtauld’s …temple of Vesta … with flaming torches. On the fireplace there are engravings of a phoenix and a salamander, creatures which in mythology were also associated with flames. Now it becomes clear that every single feature in the room is calling out to us to Think of a temple! Think of flames! The temple in the niche above the bed is very probably a modified tabernacle; if this is so, it is telling us to Think of bread and wine! Think of a god(dess)! Bread, wine and fire were the symbols of the goddess Vesta. The symbolic meanings of every item in the room are now very clear. Opening the door to Virginia Courtauld’s suite of rooms, there is a tiny, circular room with a dome roof with a window in the top. This area appears to have no function; it is not a dressing room; its purpose was puzzling. 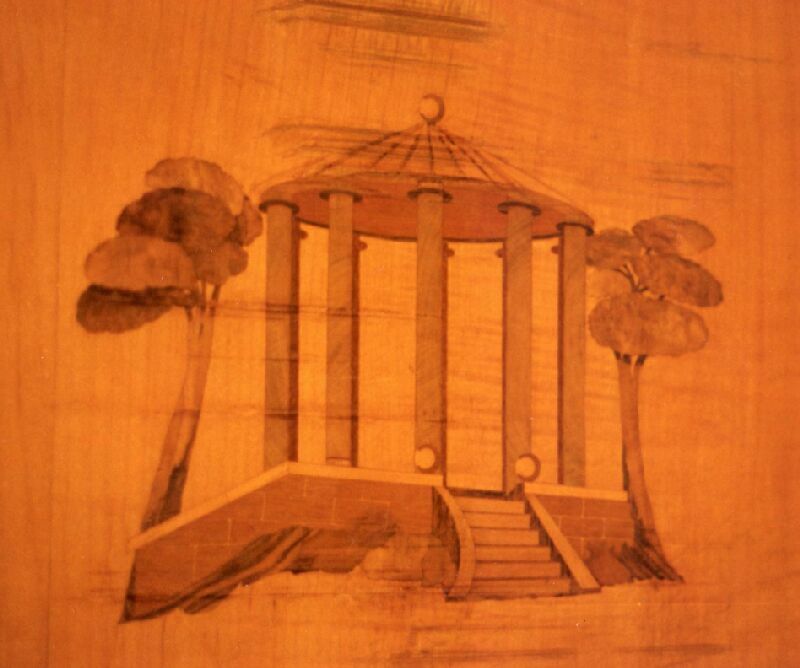 However, this is the architect’s representation of the circular interior of the temple, which would have a dome roof with an open space to allow light to penetrate. It has niches on which statues could be placed. The bathroom represents the part of the temple to be used by the priest alone. This is where he would store the gold and other valuable offerings from the faithful. The statue of the goddess of the temple would also be there. This is exactly what one finds in the bathroom: gold, and a statue of a goddess. Now we must look at the front door of the house. (See Photograph 6 above.) There is a row of pillars in a curve. If in our imagination we extend the curve, it will of course become a circle of pillars. Above the roof of the front door, but invisible from the ground (hidden behind a stone balustrade), there is a large dome. So the entrance is like a small slice of a circular Roman temple. There are trees on all sides. In the centre is a carving of a woman in Roman dress with fire, bread and wine: it’s obviously Vesta again. In this way, the front door secretly reflects the bedroom and introduces to visitors the theme of the goddess Vesta from the moment they arrive. It is as though Virginia, in the secret form of Vesta, is at the door, welcoming her guests. We have now seen the principle on which the entire house is designed. Every room in the house is a hidden representation of somewhere else entirely, and once deciphered, it is clear that the theme of each room forms a comment on one of the owners. 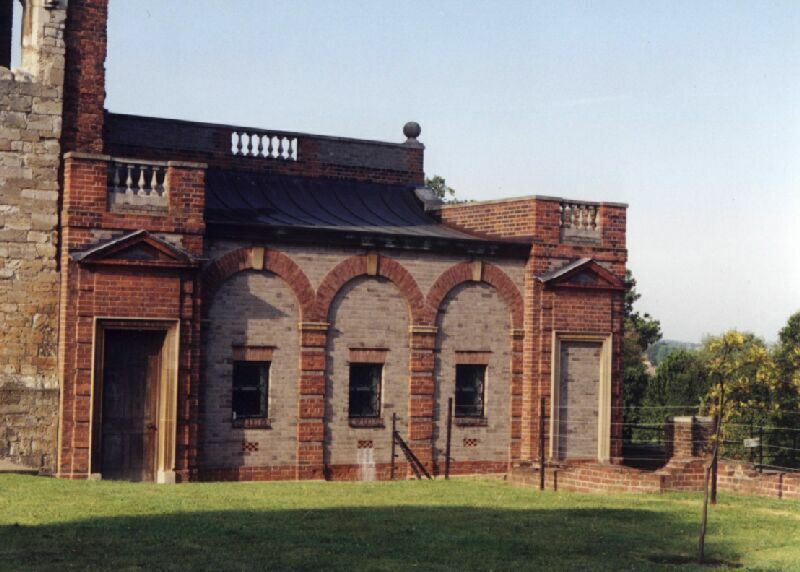 The theme of each room is also depicted on the exterior of the building. Which is why, looking at the front door (Photograph 6 above), we see that on top of the Roman temple is a Tudor house (because one of the rooms is on the theme of a Tudor king who owned the ancient palace). On each side is a tall gable which is a copy of a building in Stockholm (because one of the rooms represents a ship called The Stockholm), but with chess pieces stuck on the end as finials (because the site was once owned by a king, a queen, a bishop, a knight etc). This is the most amazing piece of architecture you will probably ever see in your life. We are not meant to admire its beauty; we are meant to be astonished, then struggle to work out its meaning, then laugh and say how clever and funny it is. Incidentally, it has nothing to do with art deco; it is completely original in style: a one-off; a work of art of the most incredible originality and imagination. We should also be aware that there are cross-clues, so that if we miss the meaning of one room, we will find its meaning suggested somewhere else. 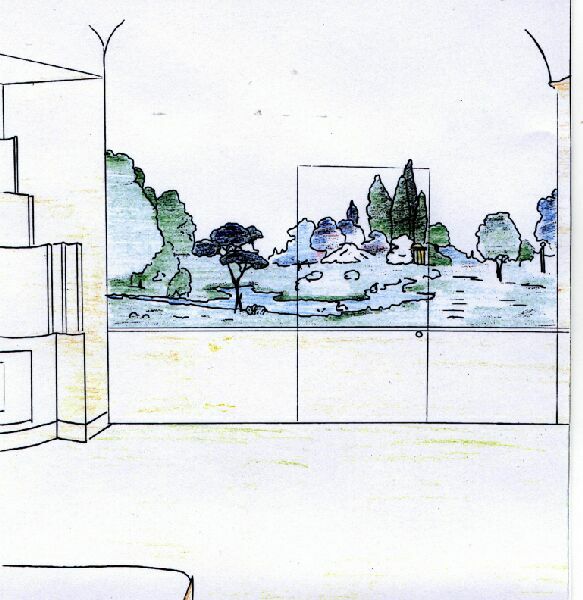 For instance (see Figure 7 above), in Stephen Courtauld’s bedroom (which actually represents Kew Gardens), the adjoining door leading to his wife’s temple-bedroom shows a picture of the circular temple which is in Kew Gardens. (You will need to look very carefully at the picture above in order to see the tiny temple, which is on the right hand edge of the door.) It is as though we are being told that the door leads to a temple. Sometimes one single clue has two or three symbolic meanings; the degree of lateral thinking of which the architect was capable is astonishing. 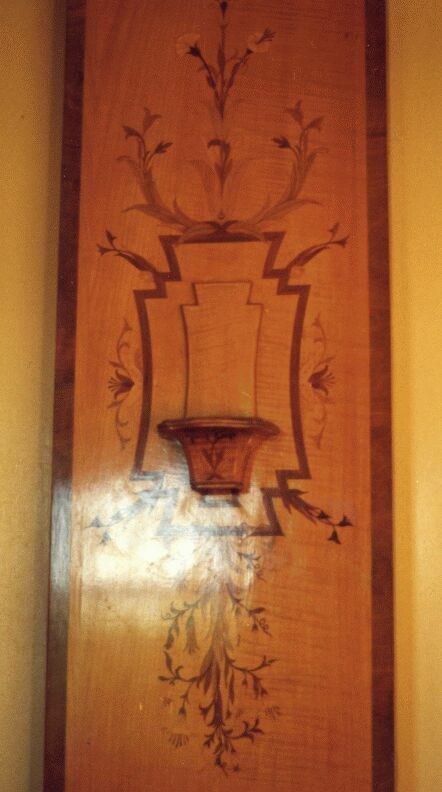 We shall now look at the dining room (see Figure 8 above) . It is the ceiling which tells us what the dining room represents. The ceiling outlines the shape of an impluvium in the atrium of a Roman house, ie a rectangular opening in the roof over the courtyard of a Roman house, where a reservoir below would collect the rainwater. In fact everything in the room is Roman in style: the table, the chairs, the wall table, the key pattern. Why should the room represent a Roman atrium? Because in ancient Rome there was a building which the Romans called the Atrium of Vesta (atrium Vestae), and which we call House of the Vestal Virgins. We are back to the theme of Vesta again. Virginia Courtauld was a well-known society hostess, and her dining room was the scene of many a famous dinner party. She was a very sociable person who liked to stay up till all hours entertaining, though there are many stories of how her husband used to nod off at the table. We know that every room inside the house is also depicted in another form on the exterior of the building, so we must now go outside and search for the House of the Vestal Virgins depicted on the outside. Walking round the exterior, we find it (see Photograph 9 above): a rectangular Roman building. 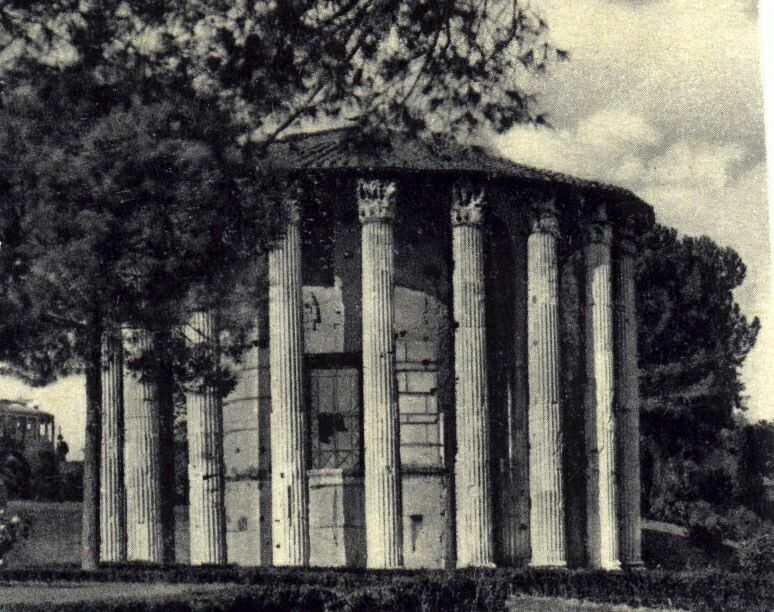 This 1930s mock-Roman re-creation of the House of the Vestal Virgins is in fact a squash court, and is built straight on to the end wall of the genuine 15th century banqueting hall. We have simply got to laugh. Visitors emerging from the dining room late at night after one of Virginia’s famous dinner parties must have been astonished to notice that on the wall a few yards away (see Photograph 10 above), was a tiny but eye-catching sculpture of the mad hatter’s tea party, complete with the dormouse asleep at the table; an unmistakable comment on the dinner party that had just taken place. The other three reliefs show the Duchess (who received an invitation from the Queen), the fish and the footman (who delivered the invitation), and the caterpillar smoking on a mushroom. These clearly relate to the high-society entertainment provided by the Courtaulds. 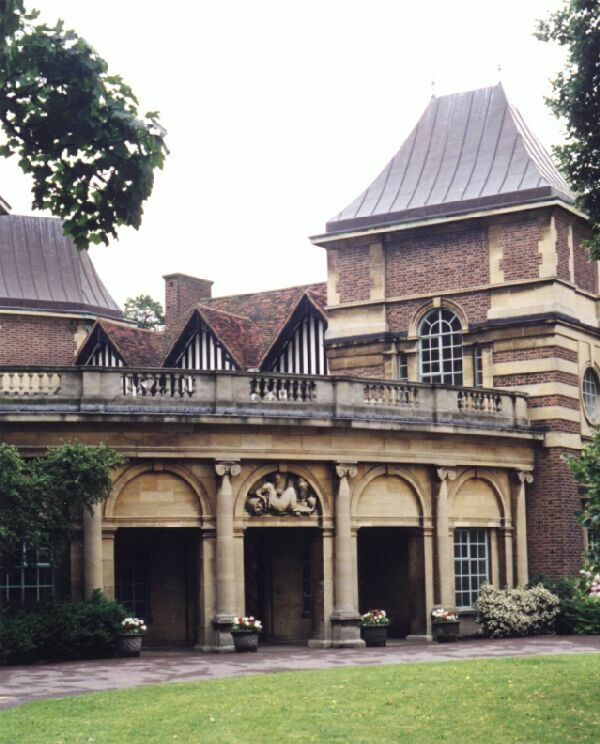 Although the architects apparently never told anyone the meaning of the architecture of Eltham Palace (except perhaps the Courtaulds themselves), John Seely did give one colossal clue: he stated that the capitals of the pillars at the entrance to the house were similar to the Ionic capitals inside the temple of Apollo Epicurius at Bassae. He obviously wanted someone to say, “Why? What was so special about Apollo Epicurius of Bassae?” Looking up the history of Bassae, we find that the inhabitants were saved from pestilence by Apollo the healer, who was of course also the god of music and poetry. Since Stephen Courtauld was a benefactor of the nation and a famous patron of the arts (as were many of the Courtauld family), this was a very appropriate comparison. If Stephen Courtauld did indeed succeed in deciphering the clues which convey this, he must have felt very flattered. 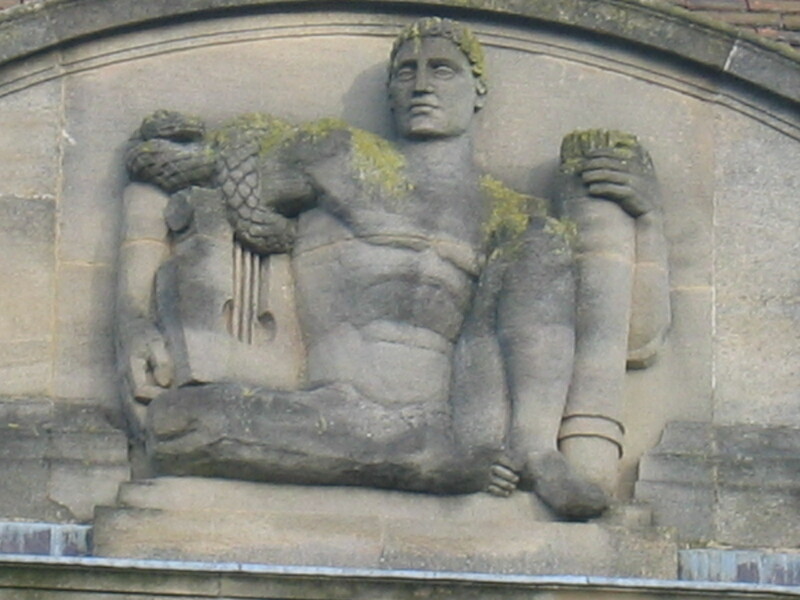 To reinforce the message, Apollo is also depicted in a large bas relief on an exterior wall of the house (Photograph 11).